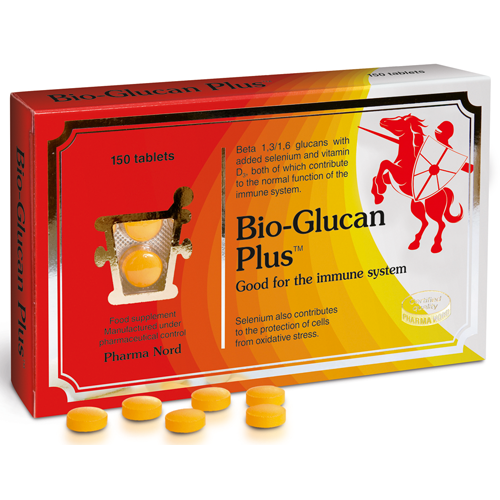 Pharma Nords Bio-Glucan Plus is a Beta Glucan supplement containing beta 1,3/1,6 glucans as well as SelenoPrecise (a patented, highly absorbable organic selenium yeast) and vitamin D3, both of which contribute to normal function of the immune system. Pharma Nord Bio Glucan Plus also contains Yestimun beta glucans with a high degree of purity (85%). This source has been chosen because the greater purity; the more effectively the glucans are recognised by the body. Pharma Nord Bio-Glucan Plus may particularly benefit individuals whose immune system has been weakened through lifestyle, stress or ageing. 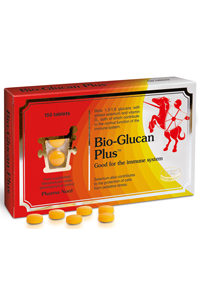 What does Bio-Glucan Plus do? Beta 1,3/1,6 glucans contained in Pharma Nord Bio-Glucan Plus act as a primer of the innate immune system. As the name indicates, the innate immune system is inborn and serves as the bodys first line of defence against infectious organisms. This is in contrast to acquired immunity which involves the development of antibodies against foreign organisms as a second line of defence. Beta 1,3/1,6 glucans provide a stimulus to activate neutrophils, macrophages, and natural killer (NK) cells of the innate immune system against infectious organisms. In addition, Vitamin D and Selenium are two nutrients that are known to play an important role in supporting immune function. Pharma Nord's Bio-Glucan Plus contains Yestimun, a superior source of beta 1,3/1,6 glucans with a dry matter content >85% and alpha-D-mannan content of<2%. The type of glucans used in Bio-Glucan Plus should not be confused with the type of glucans (beta 1,3/1,4 glucans) obtained from cereals such as oats and wheat, which have a different molecular structure and different actions within the body. Two tablets of Bio Glucan Plus per day provide 250mg of beta glucan extract, 50mcg SelenoPrecise and 10mcg vitamin D3 (cholecalciferol). Patented organic selenium yeast, SelenoPrecise has a documented bio-availability of 89%. Selenium and vitamin D3 are known to play an important role in supporting immune function. Pharma Nord recommends 2-4 tablets to be taken per day or as directed by a physician. To be taken with food. Microcrystalline cellulose, Dicalcium phosphate, Tricalcium phosphate, Polyvinylpyrrolidon Magnesium salts of fatty acids, Hydroxypropyl methylcellulose, Talc, Titanium dioxide, Riboflavin.